Embiggen Yourself: Dioramas ! What year is it ? Dioramas ! What year is it ? 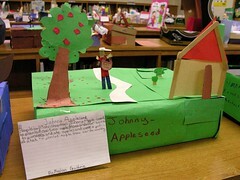 If you are in the 3rd grade, I guess May is diorama month. But this got me thinking how many dioramas are needed until the hot glue gun and such are mastered. Because I don't think this medium is too educational beyond the craft-skills level. How about teaching the kids to use Google SketchUp to make a virtual diorama ? Or iStopMotion to make a little educational movie set in a diorama ?